La Villa de Soledad is a family run bed and breakfast style hotel in La Ceiba Honduras. Its unique, lovely location will give you the feeling of being in a remote corner of Central America. Yet it is lies only 9 km outside the city of La Ceiba, Honduras. Our boutique bed and breakfast Hotel in La Ceiba Honduras overlooks the Cangrejal River. Enjoy the stunning views of the forests towards Pico Bonito and Nombre de Dios National Parks. We provide one of the best lodging options within Pico Bonito National Park. We offer 5 individually appointed guest rooms. 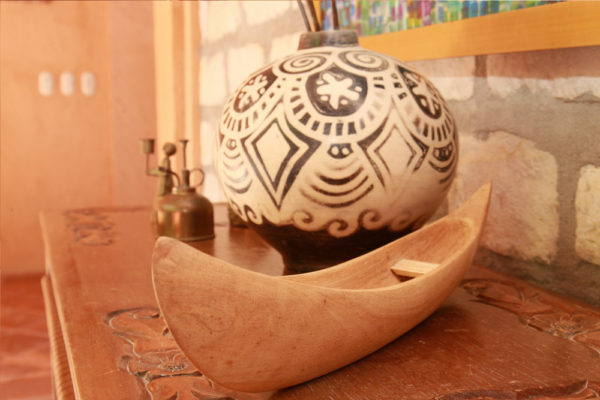 Each room has a with a private bathroom and original paintings by Honduran artists. French doors open out to the great outdoors. Through them you have the perfect setting to discover the tropical rain forests of the of Central America. There is no better La Ceiba Hotel to relax in and enjoy nature with comfort. Soledad and John provide friendly, bilingual service. As your innkeepers who live on premises they will help you arrange local activities. Your accommodations will provide a memorable experience and blend into your mood. The setting is ideal. Regardless of whether you are looking for an adventure filled vacation or a relaxing time to catch up with yourself, you will love it! Are looking for a Hotel in La Ceiba, Honduras that provides access to many diverse activities? Or perhaps you are looking the perfect hideaway to disconnect from your routine? Either way, La Villa de Soledad is the perfect family run hotel in La Ceiba Honduras for you! Hike in a network of trails located just across the Cangrejal River. Explore and discover the jungle secrets. Access the park via a 120 meter (400 foot) suspension bridge. Crosses high over the white water of the Cangrejal River. View the famous World Class rafting and kayaking class III, IV and V rapids. This bridge is a brief 4 minute walk from your hotel room. Other activities available include outstanding white water rafting and kayaking. A zip line canopy tour is only 800 meters, half a mile, down river. Are you need of an adrenalin rush? Try the canyoning tour in the hidden waterfalls of Nombre de Dios National Park. As you can see, there are plenty of activities available! Your hosts will be happy to help you arrange transportation to and from La Ceiba. Just ask when making your reservation and we will arrange it for you!